This year, along with my word of the year, I am focusing on a theme each month and creating goals around that theme. Similar to my happiness project last year, I hope to cumulatively build on the habits I create with each monthly theme. Each month I’m sharing my goals, along with a few wins and things that brought me joy from the previous month, as joy is the word I’m focusing on in 2019. 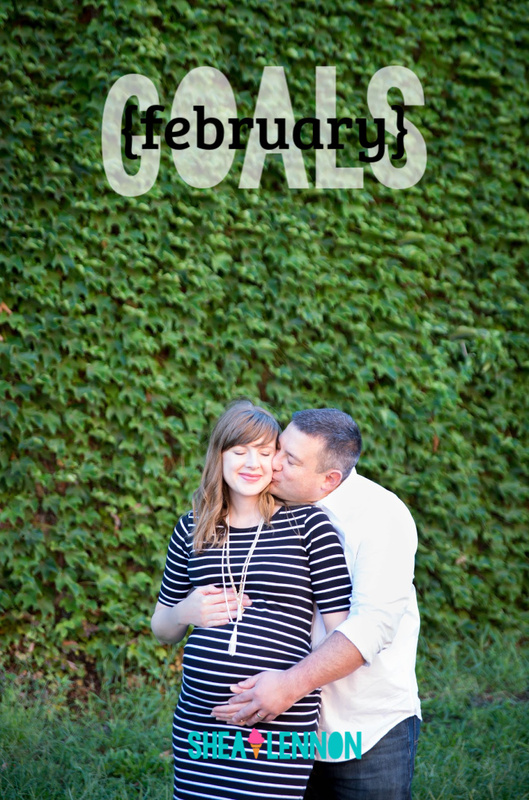 In January, I focused on clearing clutter, while February is all about marriage. Can you believe I couldn't find a more recent GOOD picture of Aaron and I?? Last month I wanted to focus on getting rid of clutter, because the new year feels like the perfect time for this kind of fresh start. Here are a few of my decluttering wins. - Started reading and working through 365 Daily Do-Its, which features a decluttering or organizing task every day. I completed the task most days, with a few exceptions (such as the day it said, “Clean out your basement.” as if that were a little task I could complete on a Tuesday evening.). - Developed a system for incoming mail and paperwork. A few of my favorite podcasts published episodes that came at the perfect time, and the system I created was inspired by The Lazy Genius “Organizes Paper” episode and The Girl Next Door Organization that Works episode. I shared my system on Instagram stories (favorites category), but basically I created a few different locations for incoming papers. I have a location for items that need immediate attention, a basket for less urgent items that I go through weekly, another basket for all the artwork my kids bring home that I will go through when it gets full, and file boxes (created last year) for Jona and Violet for keepsakes and artwork that I want to save. - Organized the area that serves as our “command center”. It is still a work in progress, but I’ve been better about not using the bookshelf as a dumping ground for random items and papers. The paperwork system has helped with that as well. - Straightened our office/spare bedroom. We used this room for all the Christmas stuff: wrapping, gifts, etc. I moved all that to storage and the boxes are slowly being recycled as we can make them fit in our recycle bin. - Organized Jona's Legos. This was driving me crazy! Legos were taking over our house because his collection outgrew the previous storage solutions we had. So this month we went to IKEA and bought a new storage system with shelves to display his creations. It still gets cluttered with all his in-progress items, but it is working a lot better. - Started reading The Life-Changing Magic of Tidying Up. I’ve been inspired by the Netflix show, so I hope to try Marie Kondo’s method. I’m not sure I’ll completely KonMari my house, but I’d at least like to try it with clothing. - Books. I read 6 in January, I'll share my recap soon. - A new job! At the end of last year I mentioned that I was going to start a new job, which I did at hte beginning of the month. It has been going really well so far. I like my boss and the people I work for, and I'm excited about the things I'm learning. - Going to see Bohemian Rhapsody with Aaron, my best friend and her husband. Not only did a date night out without kids bring joy, but Abby’s choice of movie was fantastic. I have always loved Queen, but that movie really made me love and appreciate them even more. RIP Freddie Mercury. - Starting a ritual of watching This Is Us with Aaron. Earlier this month we talked about how we used to watch shows together, but since having Jona and Violet we rarely watch anything together (more often, he’s watching something while I read or blog). We’re only a couple of episodes in, but we are both hooked on it so far. - How much Jona and Violet love playing together. It’s clear that they really miss each other during the day, because they spend hours every evening jumping around in Jona’s room, playing ninjas or superheroes. Sometimes I fear someone will get hurt (and sometimes someone does) but mostly I try to let them play the way they like--even when it involves Violet bringing in a step-stool so that she can jump onto the bed. This month's I'm focusing on improving my marriage. I think I did this last February too, but I think it's something I want to continually work on! - Plan a day date for this month. Aaron and I have been wanting to go out on a daytime date for a while now. We don’t have anything planned yet, but it sounds like a fun alternative to a typical evening date (in which I struggle to stay awake past 10pm). - Continue our weekly show-watching ritual. I hope to make our This Is Us ritual a weekly thing (or more). It’s nice to have something to look forward to together instead of just sitting next to each other on our devices. - Don't be critical. This is where my Enneagram one/control freak tendencies come in. I struggle with being too critical, especially with anything involving household management or parenting. I want to work hard this month to catch myself when I start to criticize. - Assume positive intentions. This kind of goes along with being critical, but too often I create stories in my mind around why Aaron does or doesn’t do certain things. Instead of assuming the worst, I need to do the opposite, because more often than not his intentions are positive. - Be more affectionate. Parenting young kids means that some days it feels like we're just roommates, but I'd like to make more of an effort to change that, even if it's just with a hug in the morning or holding hands when we're in the car. - Schedule date nights (or date night reminders) on our shared calendar. Do you have any goals for February? What is something that brought you joy this past month?